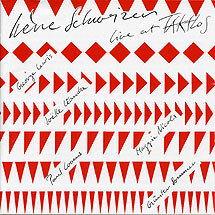 Irène Schweizer, piano; George Lewis, trombone; Maggie Nicols, voice; Günter Sommer, drums; Joëlle Léandre, bass; Paul Lovens, drums; Lindsay Cooper, piano. Maggie Nicols, voice; Lindsay Cooper, piano: Every, now and then (01.21). Recorded on 4/5 February 1984 at the Taktlos Festival, Rote Fabrik Zurich. Cover design (reproduced above) by Ruedi Wyss. Originally released as Intakt LP 001 in 1986.